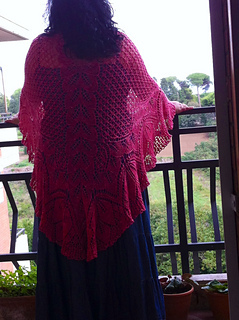 The first picture shows the original version of the Berkanan Shawl. 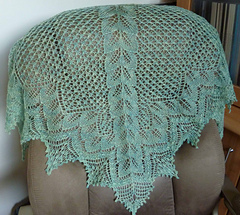 A larger version, the Berkanan and Leaves Shawl, sporting a wider ruffled edge, using up towards the double amount of yarn, is included as a bonus when you buy this pattern. The alternative edge is shown on pictures 2 and 3. The following text covers the original Berkanan Shawl. No part of the shawl can, in a simple way, be repeated to make the shawl larger, or taken out to make it smaller, as the edge is rather complex. The only way to adjust size is by using finer or heavier yarn and/or needles. 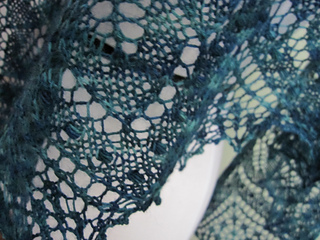 Pattern suggests Fleece Artist Suri Blue, a heavy lace 2-ply wool/alpaca, 600 m(656 yards)/100g skein, 1 skein. 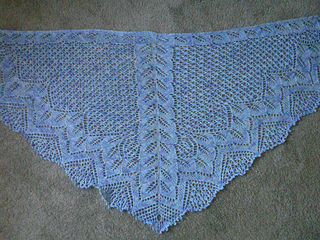 The shawl as shown used the entire skein down to the last few yards. Buy 2 skeins to be entirely sure you have enough. The yarn suggested has been discontinued, but any lace yarn will do, as long as it’s blockable. 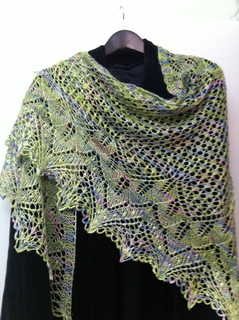 If you want a larger shawl, use heavier weight yarn. Remember that you then will need more than 600 m (656 yards). The Berkanan Shawl is 154 rows deep, so you could make a swatch to see how much 10 rows measure in the yarn you wish to use, and multiply that with 15,4. That should give you an idea of how large it is going to end up being. The pattern has a choice of adding beads or nupps. You need approx. 150 beads for that, and if you add nupps, you will need more yarn. My guess is perhaps 100 to 200 meters/yards more than the 600 you would need without nupps, depending on the weight of your yarn. 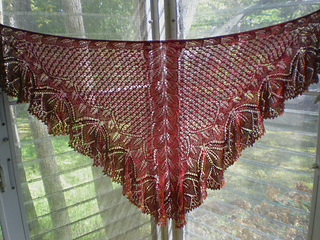 If you use finer yarn, you might be able to knit the entire shawl with nupps using less than the stated amount of yarn. I would recommend that you see the different projects already linked to this pattern for examples of yardage and measurements. Berkanan and Leaves Shawl uses up towards 1200 yards or 1100 m with nupps. Again, the edge is so complex that there is no easy way to either decrease or increase in size by omitting or repeating part of the pattern. Instead, knit it in finer yarn than suggested if you want to make it smaller, or heavier yarn if you want to make it larger. The alternative edge adds about 10 cm or 4 inches to the original size with a not very aggressive blocking.